"The following quotation is from Letters to Malcolm: Chiefly on Prayer, which is Lewis's side of a correspondence between him and his fictional friend, Malcolm, and was published in 1964. 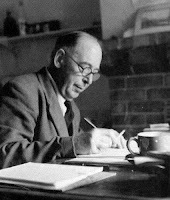 And by the way, "C. S. Lewis on Saturdays" rings better than "Some Saturday C. S. Lewis". Sorry for putting you through two weeks of the old title. "Gratitude exclaims, very properly, 'How good of God to give me this.' Adoration says, 'What must be the quality of that Being whose far-off and momentary coruscations are like this!' One's mind runs back up the sunbeam to the sun. If I could always be what I am at being, no pleasure would be too ordinary or too usual for such reception; from the first taste of the air when I look out of the window- one's whole cheek becomes a sort of palate- down to one's soft slippers at bed time. I don't always achieve it. One obstacle is inattention. Another is the wrong kind of attention. One could, if one practised, hear simply a roar and not the roaring-of-the-wind. In the same way, only far too easily, one can concentrate on the pleasure as an event in one's own nervous system- subjectify it- and ignore the smell of Deity that hangs about it. A third obstacle is greed. Instead of saying, 'This also is Thou,' one may say the fatal word Encore. There is also conceit: the dangerous reflection that not everyone can find God in a plain slice of bread and buttter, or that others would condemn as simply 'grey' the sky in which I am delightedly observing such delicacies as pearl and dove and silver."